Crime Intervention Alarm provides a variety of business security solutions to fit every type of business. Our professionals will assess common security risk factors such as building, size, and employee and customer traffic to determine what security options are right for you. Use the latest technology to protect your business from theft and damage inside and outside your building. Record on motion, email clips to authorities and record full HD video and audio for your peace of mind. 120+ Days Record. Complete business security may mean something different to others, but to Crime Intervention Alarm it means from start to finish and beyond we develop custom solutions that fit every business need, size, and budget. Each of our systems interacts with each other providing better safety and ease of operation for the business owner and security staff. We’ve provided complete security, surveillance, fire and access control solutions for businesses like yours for over 20 years. 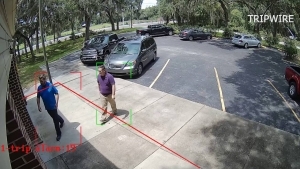 Interior/Exterior Monitoring Devices: Use the latest technology to protect your business from theft and damage inside and outside your building. Advanced Camera Systems: Record on motion, email clips to authorities and record full HD video and audio for your peace of mind. 120+ Days Record. 24/7 Customer Support: We put our existing customers first! We provide excellent customer service and 24/7 support for all Crime Intervention clients. Already have a surveillance system in place? 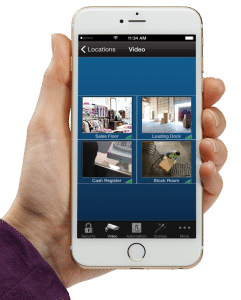 We can use your existing security cameras and incorporate them into your new business security system, allowing you to make the most of your investment in the safety of your property. Crime Intervention Alarm lets you manage all aspects of your security system remotely with a computer, tablet or phone. Monitor employees and your business at any time by connecting to the live feed of your cameras. You’ll receive instant push notifications to your phone or email when events are triggered. For example, if our systems detect someone approaching a building, you can get a notification for that — but people leaving can be ignored. With our high definition cameras, you’ll be able to monitor your business with crystal clarity during all hours of the day, even in the middle of the night! We create custom camera solutions that complement your security system and overall business needs well. We have devices that can capture fleeing vehicles license plates in the middle of the night over 100 feet away! Looking to hear your employees through your cameras? We’ve got you covered with that too! A business alarm system will trigger in the event of an unauthorized entry using sensors. 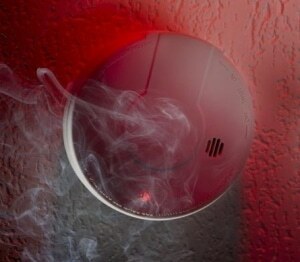 A loud 100db+ alarm will make a sound when it is set off and will alert you or your monitoring system of an intrusion. The alarm will also scare off any unwanted intruders. Your York business will be protected 24/7 with CIA. 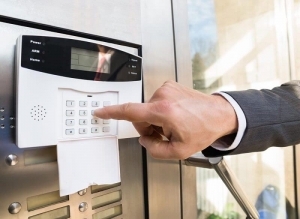 Access control systems are a type of commercial security system that allow you to control traffic flow in and out of your building without the presence of security personnel. 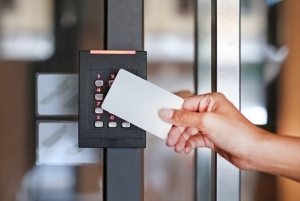 Keep your business secured with a variety of equipment such as key fobs, fingerprint scanners, gates, and more. We provide complete customized systems that work perfectly for any business type, size or budget.  CIA has three UL certified alarm monitoring centers located throughout the country with trained, professional operators at the ready. 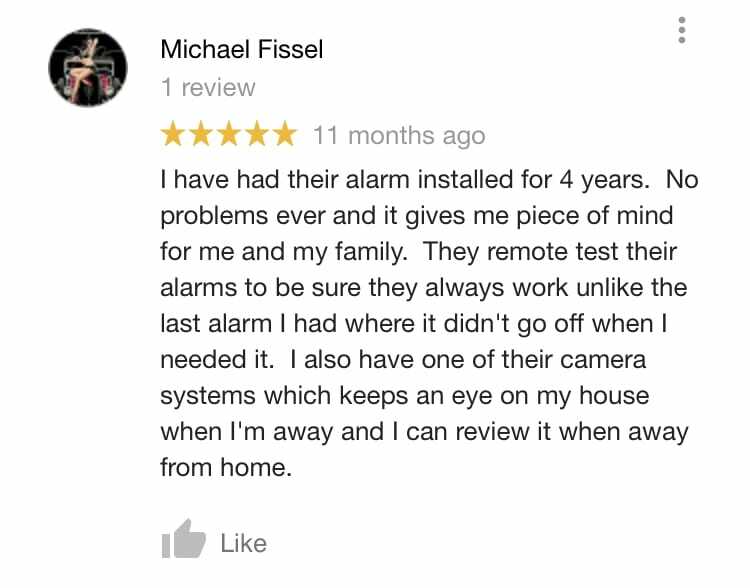 So if your alarm goes off when no one is there, the monitoring center will still be able to take action on your behalf. Each center is backed up and has uninterruptible power supplies, so you’ll always have the fastest monitoring service with you and/or the authorities being notified within 13-19 seconds of a problem. Contact us today for a quote on our home and business security systems, security monitoring services, and any of the many other products and services we offer to keep you safe and secure. We’ve had over 20 years of experience installing complete home and business security solutions. We know all of the best practices and can work with nearly any budget. In today’s world, the safety of your faculty and staff is priority and therefore we strive to be #1 in commercial security applications. Complete Business Security is a Call Away. 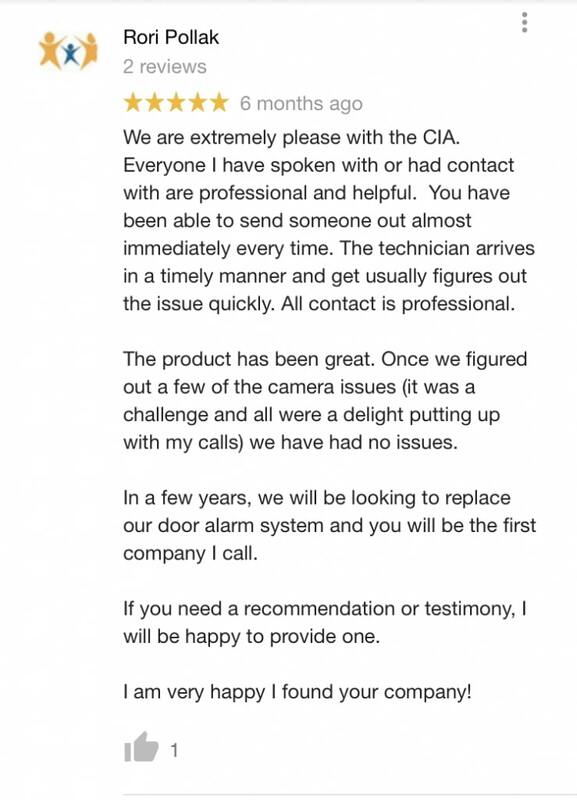 What are some specific solutions CIA offers?